Robust citrons with their leafy branches still attached fill a worn ceramic bowl to overflowing in this meticulous still life. Giovanna Garzoni's acute observation of nature and refined handling of paint are evident in the carefully rendered citron skin, and in the wasp's delicate wings. With its central bowl of fruit, this painting is characteristic of Garzoni's style; a single flower or insect placed in front of the picture plane adds interest to the composition. Garzoni deliberately manipulated textures and shapes, contrasting the citrons' rough skin and rounded weightiness with the sharp-edged branches, the glistening, green leaves, and the delicate, star-like blossoms. Scientific research and illustration were of great interest to those who participated in court life in the 1600s. As a result, paintings of natura sospesa, "nature suspended," were quite fashionable. 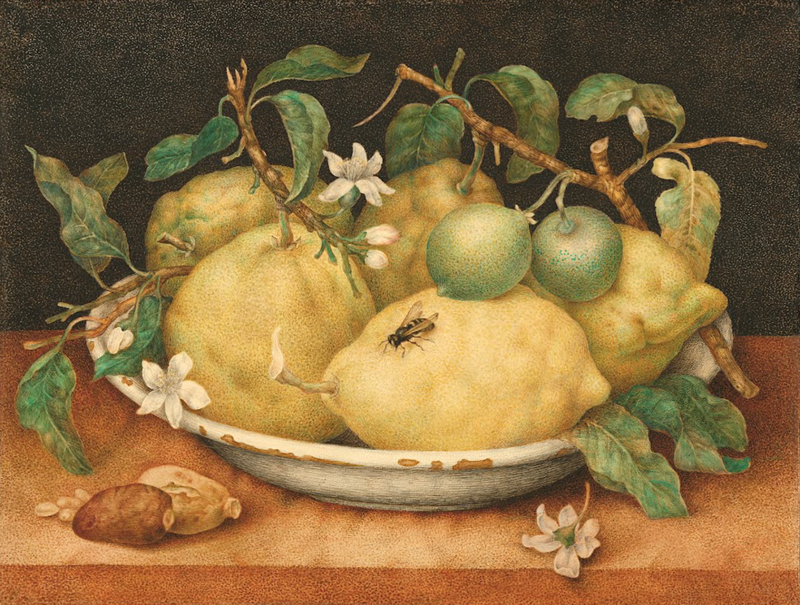 Garzoni's skillful depictions of natural objects, usually fruits and insects arranged in pleasing ensembles, were among the paintings most coveted by wealthy patrons.